Home » » Suspected cultist arrested over killing of Police Sergeant in Lagos. Suspected cultist arrested over killing of Police Sergeant in Lagos. The suspect, Malik Onebiri popularly known as Kobad Baron, was arrested in Gboko, Benue state, where he took cover after the incident. Recall that the deceased policeman, Sergeant Collins Eseabor, was allegedly attacked by Onibiri and his members who were protesting the death of one of their own. Their late colleague identified simply as Shina, was fleeing an Indian hemp joint, on sighting a team of policemen on raid, in his bid to evade arrest. In the process, he scaled a fence which collapsed on him. The fatally injured man was reported to have taken to self medication until the situation got worse before he was rushed to the hospital, where he died after some days. However, on their arrival from the Lagos State University Teaching Hospital morgue where they went to pick Shina’s corpse for burial, youths , most of whom were alleged to be members of Eiye group, stormed Area ‘G’ command, threatening to set it on fire. But they were prevented, by policemen who were under instruction not to react. Not done, the protesting youths attacked a Police patrol team stationed at Haruna bus stop, in the process of which Sergeant Eseabor was shot dead. The police patrol van was also vandalised. 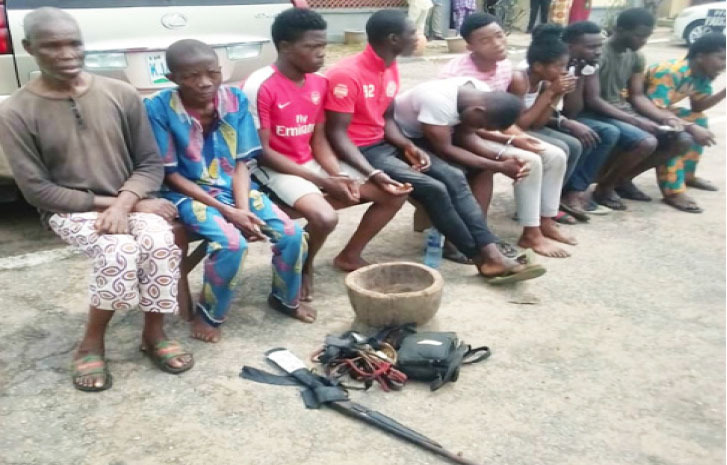 Confirming the arrest of the suspected ring leader, the Police Public Relations Officer, CSP Chike Oti, said 19 persons were arrested earlier in connection with the murder of the policeman. According to Oti,: ” In keeping with the pledge of the CP that the leader of the group, one Malik Onebiri, alias Kobad Baron who allegedly fired the shot that killed the officer, could only run but not hide, operatives of the command attached to Area ‘G’ Command, Ogba, swung into action and have so far arrested 19 persons who took part in the crime. “Meanwhile, the arrow head of the group, one, Malik Onebiri, left the state immediately after the attack on the police team. However, through discreet investigation carried out on the matter, police detectives arrested the said Malik in his hideout in Gboko, Benue state. “The CP reiterates that the command will visit the full weight of the law on anybody or group that resorts to self-help or jungle justice in matters requiring the intervention of the law”.